Click on the bulbs and mirrors to locate the whereabouts of the atoms. Minesweeper type variation game. The box is divided into a certain number of blocks. Each of these blocks can contain an atom. When the game begins all the blocks are closed but during the game you can either open or mark them. You can mark a block if you are not sure if there is an atom inside of it. Open the blocks only if you know for sure that they are empty (if they are not - the game will be over). The lightening method will help you to find the atoms. You should use the lamps generating light situated at the sides of the box. The beams of the lamps can either be reflected or dispersed by the atoms (see the picture). Your goal is to find the atoms within the shortest possible time. 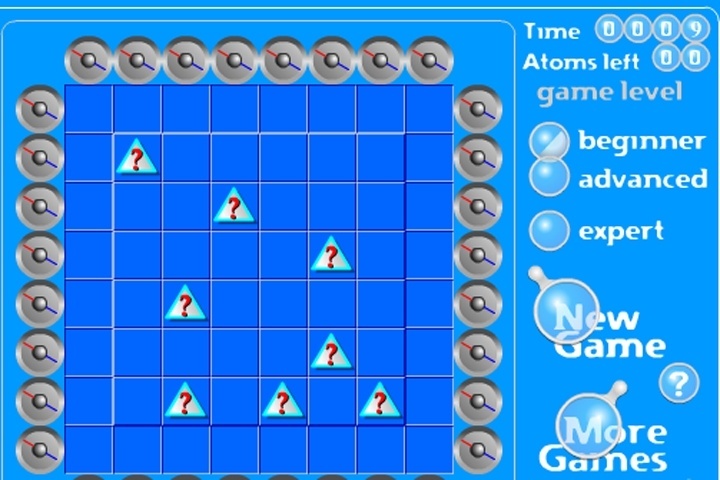 If you want to play Atomic Mine sweeper games online you have come to the right place! GamesLoon adds new Atomic Mine sweeper games every week. This is your game portal where you can find the biggest collection of free Atomic Mine sweeper games online. Do not forget to rate our Atomic Mine sweeper free online games while playing!